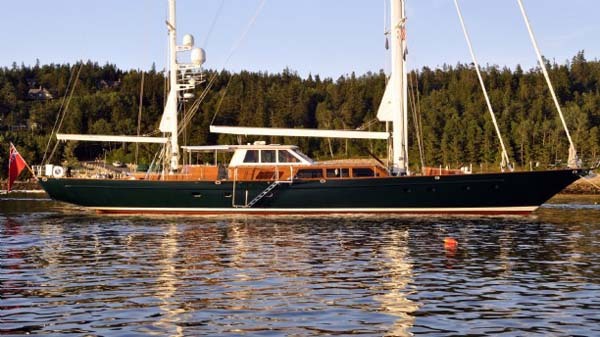 110' (33.5m) Sailing Yacht "KEEWAYDIN"
KEEWAYDIN is an extremely capable world voyaging yacht. She is fast, safe and sea kindly in all conditions. Her powerful sailplan is easily managed by a small crew, with in mast furling for the main and mizzen masts, hydraulic furling headsails and hydraulic winches to manage the loads. 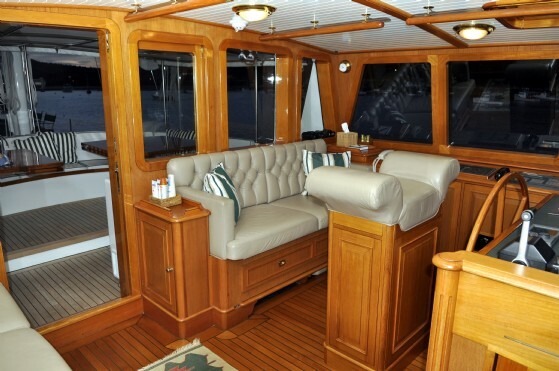 On deck, her layout provides full protection from the elements with a large settee and dining/cocktail tables aft, additional seating, refrigeration and other amenities. The pilot house is equally comfortable with 360 degree visibility, all operational, navigation and communication equipment. 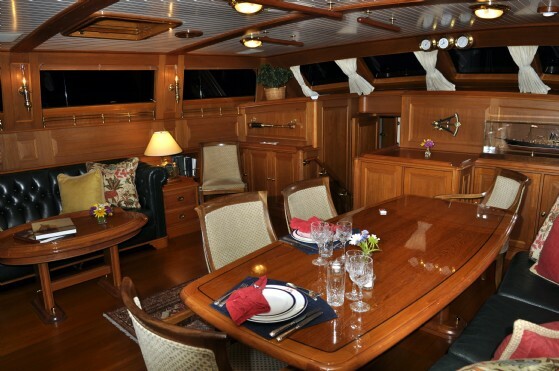 Her interior, with full width Owner�s Suite plus two Guest Staterooms all with ensuite heads, was designed by John Munford in classic, raised panel, varnished mahogany, accented with marble and rolled leather. The interior was created in a traditional style that is all too rare these days. The d�cor is elegant in its simplicity. KEEWAYDIN sets the benchmark for proper pro-active maintenance, with all systems kept in absolutely, first class condition. Her annual maintenance and refits have kept the yacht fully current with regard to the most modern systems aboard any yacht and every system is managed with an eye to proper care and redundancy. 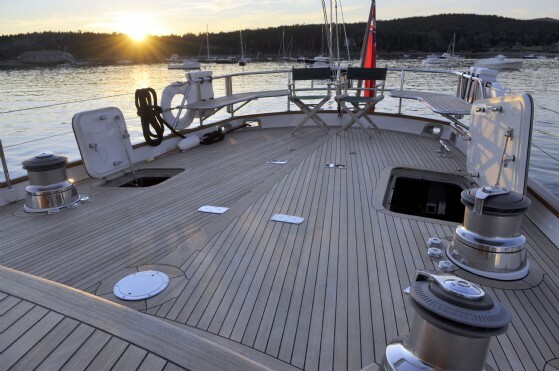 From this starting point, the yacht underwent a comprehensive refit in 2010, which updated virtually every system aboard, including cosmetics, with all new Awlgrip on all surfaces, all new teak decks and an exhaustive list that cost in excess of $2M. 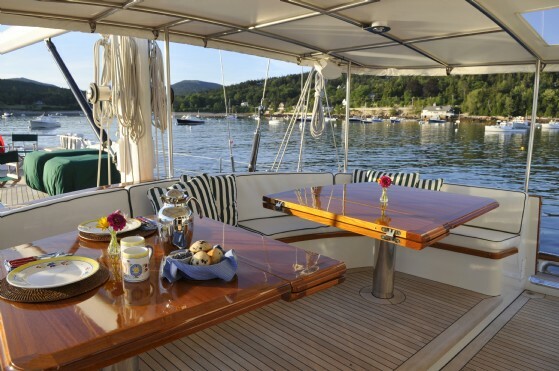 Under her present ownership, the yacht has cruised far and wide, from her home ports in Naples, Florida and Seal Harbor, Maine, she cruised the Caribbean annually, with additional trips to the Balearic Islands off Spain, Croatia, Sweden, Finland and Estonia. This is one of the few yachts that has been truly used as a yacht should be; a vehicle for cruising all points on the globe in absolute comfort, security and style..